Sometimes when band members reunite, it's as if no time has passed and nothing has changed. That couldn't be further from the truth for 10 Years. And, that's a good thing. When guitarist/drummer Brian Vodinh and guitarist Matt Wantland returned to the Knoxville, Tennessee alt-metal/post-grunge band for their eighth album and Mascot Records debut, (how to live) AS GHOSTS, they burst through their comfort zones to create something new. Something better. Something career-defining. "It's funny, I named our last record, [2015's] From Birth to Burial, because I thought it was our final record because it just didn't feel like 10 Years without Brian and Matt. 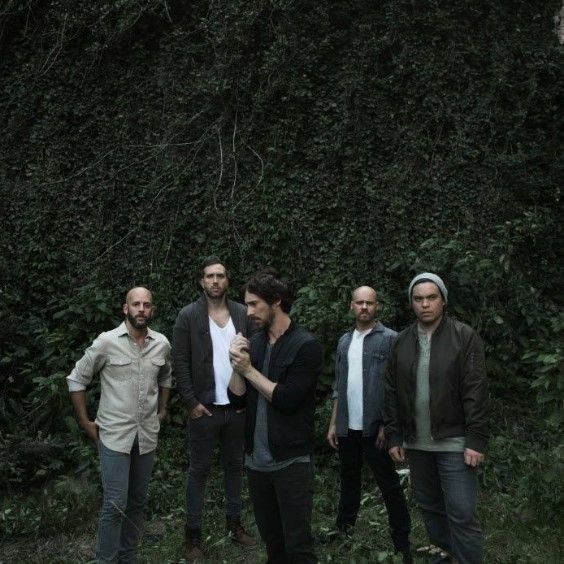 But having them back is really a reunion of the core writing team and this new record actually feels like a real rebirth for the band," says singer Jesse Hasek. While Vodinh handled drums and guitar on the new album, he's switching to just guitar for the live shows, moving Chad Huff from guitar to bass, while Kyle Mayer stays on drums. "We're bringing it back the way they should be," says Vodinh, who left the band due to family commitments in 2013. "It feels great to be back with these guys and we're in such a better place musically and creatively than ever before." That better place stems, in part, from a more collaborative writing process. "It used to be that just Jesse and I would write the full song, and the other guys would add a little spice to it. This time, we're starting the writing process as a full band. Sometimes it starts with a riff. Sometimes it starts with a vocal. Our formula is no formula, and it kind of works. And, we work together in a more constructive and healthier environment now," explains Vodinh. The sixth collaborator was Grammy award-winning producer Nick Raskulinecz (Alice in Chains, Foo Fighters, Deftones). "Nick made us step outside our comfort zone," explains Hasek. "It made for a different sounding record. The one thing we never wanted to do is recreate the same thing over and over. We have always been musicians that love to explore and venture into new horizons." It wasn't easy, the band admits. "Nick threw us curve-balls and challenged us to re-write stuff and do things we normally wouldn't have done. He helped us cut away the fat and really get to the meat and potatoes of each song. He pushed us and was challenging at times, but it helped us grow." The result is 10 Years' most dynamic and multi-dimensional record to date. Raskulinecz encouraged the band to strip away some of the vocal production they've grown accustomed to in order to reveal a more intimate side of Hasek. "Historically, we like to orchestrate a lot of vocal parts. We'll have harmonies and layers. This time around, Nick had us strip a lot of that away. There are a lot of moments where the only vocal is just Jesse, and not this big freaking epic thing. It makes Jesse more human. And I think the more human Jesse comes across, the more relatable his lyrics are," says Vodinh. Raskulinecz also helped Hasek be more straightforward in his lyrics and message. "In the past, I've written a lot of songs that were pretty ambiguous. But on this record, I'm more comfortable being direct and talking about things that are important to me. I'm older and find myself reflecting on the world more especially after having traveled the world and talk to people and really see what's going on," says Hasek. The title track, (how to live) AS GHOSTS, is one such song. "After traveling the world and seeing all the political, social, and religious turmoil, it had me thinking about how many people are judging and preparing for death, but are actually missing life. And, instead of using spirituality for good, a lot of people use it to point fingers and judge. Instead of worrying where we end up in the end, we need to focus on the now and the humanity." "Burnout" is another observation on mankind. "It's about a person that's right there in the limelight, has every opportunity to see the greatest things in life that are right in front of them, but they are too inside themselves to see it," says Hasek. "Blood Red Sky" was originally from a solo EP Vodinh had recorded. "The song grabbed my ear the first time I heard it because it had such a different vibe," says Hasek, "but I had a different vocal idea for it so we changed it up. It's about the struggle of maintaining everyday life and how fast your existence just flashes before your eyes. But, it also says that we are surviving and will make it through — that we will always fight through." On the first single, "Novacaine," Hasek looks inward. "Six albums and a hundred songs in, I wondered if I've already written my best stuff," he admits. "But at some point, you start to get real adult problems. Life has such a numbing to it. You see people go from such optimism in their 20s to having life just beat them down later. I think we all kind of get desensitized and numb to life on some level. That's what this song is about." 10 Years has come a long way since their inception in 1999. The band landed a deal with Universal/Republic Records on the strength of their two independent releases, 2001's Into the Half Moon and 2004's Killing All That Holds You. Their major label debut, 2005's The Autumn Effect, debuted at No. 1 on Billboard's Heatseekers Album chart thanks to their breakthrough hit, "Wasteland," which topped Billboard's Modern Rock Tracks chart, and "Through the Iris," which hit No. 20 on Billboard Hot Mainstream Rock Tracks. The band followed that success with 2008's Division, featuring co-production work from Rick Parashar (Alice In Chains, Pearl Jam). The album peaked at No. 12 on The Billboard 200 and spawned the hit "Beautiful," which reached No. 6 on the Hot Mainstream Rock Tracks. The momentum continued with 2010's Feeding the Wolves, which was produced by Howard Benson (My Chemical Romance, 3 Doors Down) and bowed at No. 17 on The Billboard 200, while the single, "Shoot It Out," peaked at No. 6 on Hot Mainstream Rock Tracks and spent 25 weeks on the chart. The group, which toured the world with such rock greats at Linkin Park, Korn, and Deftones, went back to their indie roots with 2012's Minus the Machine on their own Palehorse Records, which was part of Warner Music Label Group. The album debuted at No. 2 on the Hard Rock Albums chart, No. 8 on the Top Rock Albums chart, and No. 26 on The Billboard 200. "We self-produced our last few records, so it was good to give the reigns over to someone else for the first time in awhile. We had to really let go and trust and I think in doing that, it opened us to new ideas and helped us stretch creatively," says Hasek. (how to live) AS GHOSTS might be the band's 8th album. But, to them, it feels like a new start. "There was a heavier, darker tone to our last record because we weren't in a good place," adds the singer. "Ghosts has a brighter side to it because we're all in a really happy, optimistic, and excited place about music and life. We're ready to see how the world embraces it."